Uh-Oh, Johnny Manziel made the tabloids yet again and, in a completely unsurprising turn of events, it is not for stellar quarterback play. The young QB decided to leave the bright lights of Cleveland and fly to Las Vegas, Nevada for a night of introspective reflection and meditation. For those who know him, the aforementioned sentence could not be anymore of a fallacy as Johnny Manziel spent all of Saturday night and part of Sunday morning, running the blackjack table and creating ridiculous characters that only Kevin Spacey could rival. 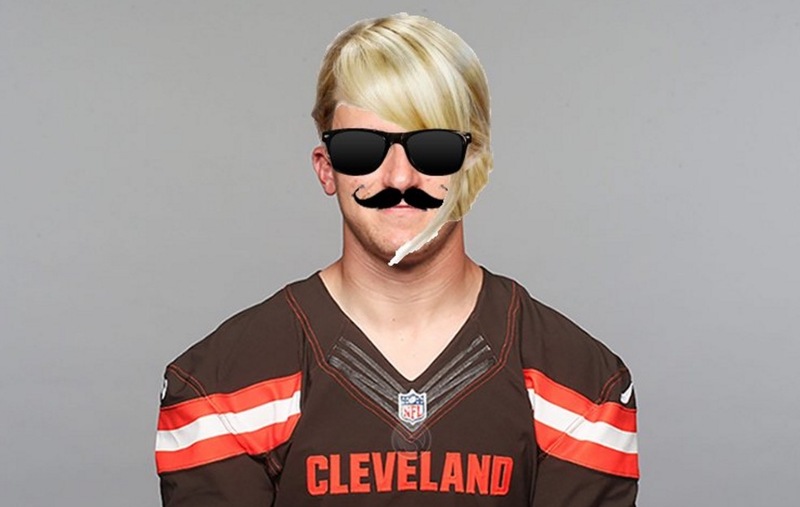 For those of you unaware of the going-ons in the wonderful world of Manziel, everyone’s favorite unprofessional professional football player, he decided to sport a blonde wig, throw on a mustache and introduce himself as “Billy” while sitting down at the playing table until about 3 am, before heading to a VIP area of a Vegas nightclub to party some more. And yes, he did all of this in his costume. All ridiculousness aside, I do not blame Billy Fútbol for creating himself an alias during his Vegas excursion. The press would have eaten him alive had he decided not to hide his identity, even more so than did during his days at Texas A&M. Personally, I love fabricating fake back stories while going to foreign places and I can see the draw for such antics. After all, ITS VEGAS! You can be anyone you want! Its not reality. Go for it Billy. While the focus around the nation has been disappointment in Manziel for his immaturity and self-centeredness, I am most disappointed in him for his slapstick effort at this Billy alias. Blonde wig? Glasses? Naming yourself Billy??! You can be anyone you want to be and you chose “Billy”? That’s just lazy. No planning, no anticipation of future events (like when this story was inevitably going to break), and certainly no creativity. ‘Billy’ is about the most vanilla alias name he could have come up with and because of that I’m happy he got caught. If you are going to throw on the blonde-wig and mustache before entering the ambiance of a Vegas Casino at least go for broke. Maybe something silly like “Sven the skier” from Norway, or go even more crazy and up the ante and tell people you are Avicii, just not Billy. In the grand scheme of things I think everyone is being a bit too critical of Mr.Manziel. He was not required to go to the game with his team on Sunday. So everyone is up in arms about him violating the team’s concussion protocol. There is no practice next week. What does Johnny need to be cleared for? I understand that rules are rules but given the circumstances this concussion test is completely unnecessary. At this point sources are saying there may never be a next week in Cleveland for Johnny. And with Cleveland having just 4 winning seasons since 1990, this poker trip was maybe a a final attempt for Manziel to jump ship. A release from the Browns may be a blessing in disguise if Manziel is able to secure a team with any sort of upside, however it is risky deliberately getting canned from your team in hopes of starting knew somewhere else, especially when in his limited playing time he hasn’t looked like the second coming of Steve Young, but as we all know Billy likes to roll the dice. Overall, I think Johnny Football has become a victim of his ever growing ego, one that is simply too big to overcome. Johnny has already been cut from his marketing team with LeBron and his playing days in Cleveland appear to numbered. If Johnny walks and no team signs him, there is a great opportunity for “Johnny Walker Rum” to acquire a new spokesperson. Maybe then Johnny would finally be able to drink and party all he wants, while going down in history as the perfect spokesperson of all time.